Yahoops! ~ The Bucky Channel - The World of Sports from Wisconsin's Perspective. 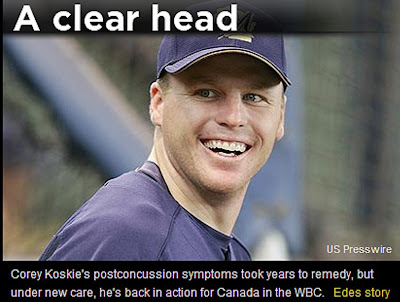 Home » Corey Koskie , Gabe Gross , Milwaukee Brewers , Yahoo » Yahoops! We here at The Bucky Channel make a lot of mistakes, we'll be the first to admit that. And even though we constantly get called out on it, the airs keep coming (catch that one?). But our blunders aren't usually as bad as some of the other errors we've seen out there, including this recent one from the guys at Yahoo! Sports late Tuesday night. As you can clearly tell, this is a picture of Gabe Gross in his Brewer days. 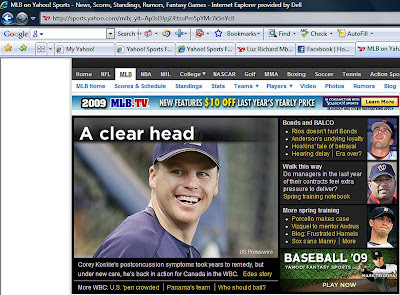 Not, as the article would suggest, about Gabe Gross. A larger picture below. Funny, in a post about an obvious mistake, you make an obvious mistake.